The trigger was reinforced previously (not the best job) with a strip of aluminum to eliminate some friction. 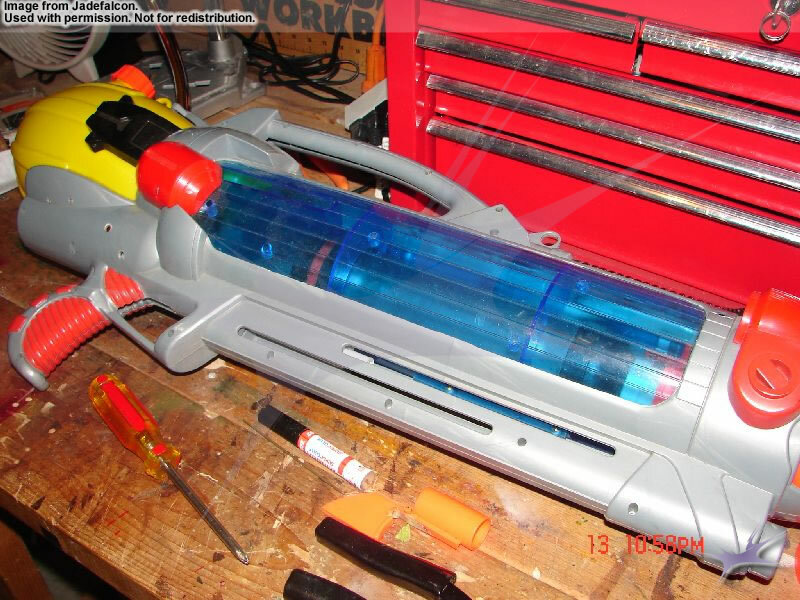 Now I am planning to add a connector rod to the back of the trigger like most super soakers of earlier design did. This is a major flaw in the design of the gun, and is the main reason why CPS 4100 rifles are so prone to trigger snap. Trigger snapping IS repairable, but it is much more difficult. If that happens or I need a new trigger, I have the capabilities of making brand new triggers. In the future I will draw up outlines to new trigger assemblies in a 1:1 scale so that users can print them out and use them as a starting guideline for shaping new triggers. The connecting rod will be shortened as long as I need it to, and it will be bent into the spring for added grip (since the shaft is smaller than the inside of the spring). The spring is from an assorted spring box you can find at a hardware supplies store (Home Depot!). There are many springs to choose from. One law must be followed in this respect: Springs always have a constant force which is commonly referred to as "k". The number of turns and the length of the spring greatly impacts it's resistive forces. I can have 5 turns and a one inch spring, and I can have 50 turns on a one inch spring, and clearly one will have more resistive power. The lower the number of turns "n", generally (depending on length) the stronger the spring. In the context of exact lengths, the smaller N is the more powerful a spring is. 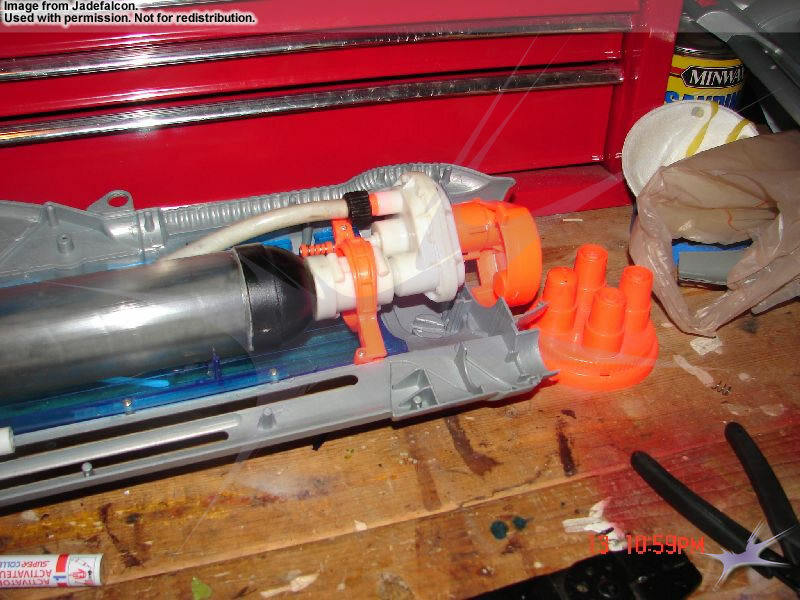 Some springs are too powerful, and can overwhelm the plastic parts. Care is needed in selecting the right spring, "what feels right" will work here. When I get back to work on it tomorrow I will post information regarding the number of turns and lengths of the spring. Analyzing where stresses will act upon the (multiple) bodies, from running a quick simulation in my head it seems that there will still be pressure on that thin piece connecting the trigger to the upper trig portion, and there will be stress on the bend rod where it is pulling and pushing the spring- but the ladder probably won't need any attention. To strengthen this area, I am going to superglue the cracks as to fill them and strengthen them. 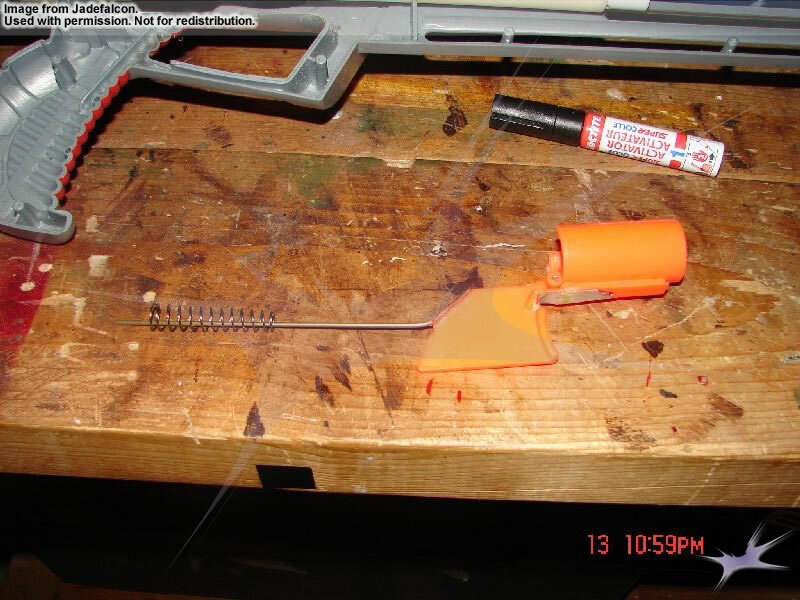 If the spring is installed correctly, it should alleviate some stress on the trigger. In the long run, it is better NOT to use a powerful and short spring on the trigger. Sure you won't have to pull as hard- but the trigger was not meant to withstand such forces. I am going to stick with a longer, but strong spring. I am currently finishing up a repair on a CPS 4100 that has been lying around for over a year in need of a repair. The repair is on strengthening the trigger and increasing it's liability. CPS 4100s were widely manufactured back at the turn of the century and they are notorious for trigger breaks and pump problems. The equation I referred to earlier is known as Hooke's Law: [F=kx]. This law does apply to more than just springs: it can apply to the analysis of elastic/plastic regions in test specimen (when you try to bend 'em or rip 'em apart). When we pull out a spring, it resists being stretched, and if we then let go, the spring returns to its original length. As we know, this is typical of elastic behavior. On the other hand, when we pull out a piece of taffy (a type of candy like chewing gum), it also resists being stretched. But, if we let go of the taffy while stretching it then nothing happens (it won't try to reform it's original shape). 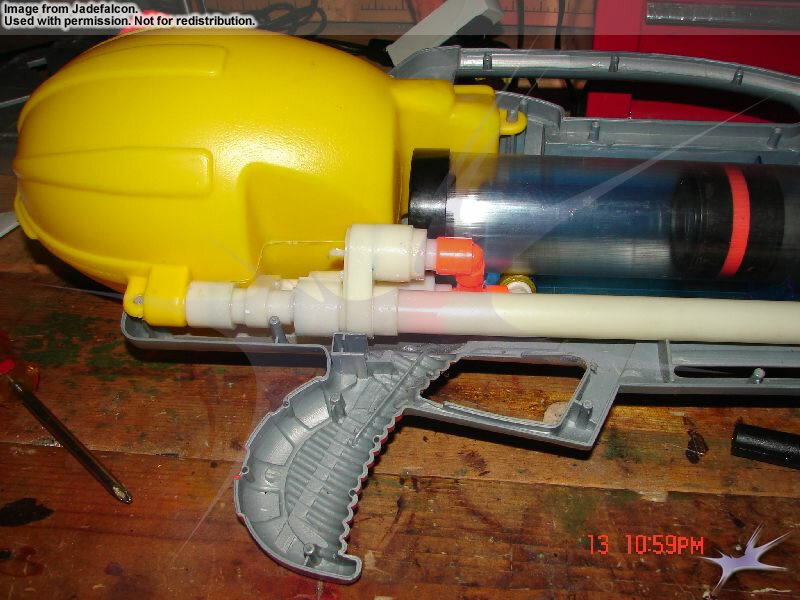 The deformation is permanent, and this is typical of plastic behavior (this also applies to every single plastic part on the gun, stretch it or bend it in some way and it will eventually fracture). In the case of the stretched spring, a restoring force comes into being as it tries to return the spring to its original length. The more we stretch the spring, the more restoring force we must overcome. The amount of "x" by which an elastic solid is stretched or compressed by a force is directly proportional to the magnitude F of the force, provided the elastic limit is not exceeded. This proportionality is referred to as hooke's law. The text goes even further into kinetic energy and other work related issues, but that snippet says a lot. Both the length of the spring and the spring constant are related, the greater either [K] or [X] is, the more force necessary to compress or stretch the spring. I will take the spring arguement one step further and apply some engineering. One thing the physics text neglects to mention is that the number of turns and the length of the spring have a significant impact on the force at which the spring stretches or pushes back against you. Sound familiar? The text is debunked- [K] is parallel in a sense to the number of turns of the spring, and distance is distance is always distance. How does this translate into what we are doing? If we include a spring with too many turns, then we will have a force pushing back against us; instead of this force pushing against our finger it will be pushing on our trigger- which has a weakpoint near the fabled break zone. In short, you will be able to pull the trigger and open the valve, but the trigger will slide back very fast, and eventually WILL fracture. If we introduce the correct number of turns, then the trigger will slide back with ease. Reinforcing the fracture zone and selecting the correct spring will alleviate pressure on that break point. It isn't technically a mechanical advantage per say, but it will help.